Dr. Leah Dunleavy specializes in Therapeutic Listening, Handwriting Without Tears, Applied Behavior Analysis, Sensory Integration, and School-based Occupational Therapy. Heather Fite specializes in Sensory Integration Therapy, Social and Emotional Skills, Visual Perceptual Therapy, Early Intervention, DIR/Floortime. Kaitlin Hughes specializes in Sensory Integration, Handwriting Without Tears, Autism Spectrum Disorder, and School-based Occupational Therapy. Alan Minyard specializes in Music-Based intervention, Sensory-Based intervention, Hands-on ADL and motor skills training, Behavior management, Autism Spectrum Disorder/Sensory Processing Disorder, Learning theory, DIR/Floortime model, and Family-centered therapy. Lauren Abry specializes in DIR/Floortime, Sensory Integration, Social and Emotional Skills, Visual Perceptual Skills, Autism Spectrum Disorder/Sensory Processing Disorder, and Down syndrome. Pediatric occupational therapy focuses on giving children the tools they need to gain independence and actively participate in occupations or activities that are meaningful to them and their families. A child’s “occupation” is to learn, play, participate in school and community activities, and become independent in self-help skills. Children rely on parents, caregivers, and teachers to foster healthy development. For this reason, pediatric occupational therapy focuses on supporting both the child and their families to develop the sensory, cognitive, motor and physical skills children need for successful participation in everyday life. Since 2007, the occupational therapy team at Eyas Landing has worked with families and other clinicians to ensure that the best client-centered treatment is provided for each child. The occupational therapy team develops individualized treatment plans that addresses each area of function, including overall development delays, not meeting developmental milestones, sensory processing, visual perceptual, motor planning and coordination, fine motor skills, executive functioning skills, and social emotional skills. At Eyas Landing, the occupational therapy team provides individual services in the home, school, community, and clinic environments to facilitate addressing all areas of the child and collaboration with the child’s team in each setting. Children with a variety of needs and difficulties can benefit from occupational therapy services. These difficulties include difficulty maintaining a calm and alert state throughout the day; difficulty with self-help skills, such as restrictive feeding, getting dressed, completing grooming tasks, and toilet training; handwriting difficulties, including legibility and task completion; decreased body awareness, including body draping over people and surfaces and difficulty maintaining an upright position while seated; difficulty interacting with peers and maintaining friendships; difficulty attending to and/or organizing an activity. Occupational therapy will look different for each child depending on the child’s needs and the focus of services. The goal is to build skills for the child, modify the environment to promote independence, and/or alter the task to support participation in daily life. Additionally, therapists and parents collaborate on how the strategies and skills in sessions can be carried over throughout the day. Successful occupational therapy treatment is a collaborative effort between the therapist(s), family, child, and other caregivers (e.g., teachers, grandparents, medical team, etc.). 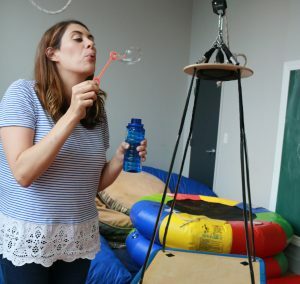 During the initial evaluation, the parent will complete a sensory-based questionnaire and the therapist will administer standardized assessments. Recommendations are made based on results of the evaluation, and a plan of care is established by the therapist & family. Home programs are also developed to facilitate carryover of treatment strategies and improve progress towards goals. The goal for occupational therapy services at Eyas Landing is to provide client centered therapy to address the child’s functioning in a variety of settings so children can achieve their highest level of independence. Therapists strive to increase the child’s overall independence across all environments and support families in building routines and roles that allow for children to interact and participate in their environments. You know your family best and the occupational therapists at Eyas Landing want to work together to meet the goals you have for your child and family.